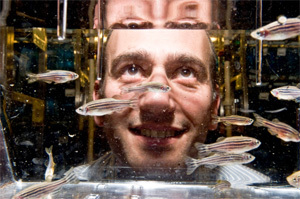 The Society for Developmental Biology awarded the 2012 Viktor Hamburger Outstanding Educator Prize to BioEYES and its co-directors Steven Farber of the Carnegie Institution for Science and Jamie Shuda of the University of Pennsylvania. BioEYES is a K-12 science education program that brings live zebrafish into the classroom to teach basic biology, including development, genetics, and ecology. The week-long program has students identify male and female fish, set up crosses, collect embryos, make scientific observations and test hypotheses. Farber, a developmental biologist, and Shuda, a former 3rd grade teacher, formed BioEYES in 2002. It was a natural outgrowth of the lab tours Farber began giving in 2001 as an assistant professor at Thomas Jefferson University during their campus-wide “Take Your Child to Work Day.” The children were able to observe adult zebrafish, as well as developing embryos and larvae under the microscope. They overwhelmingly reported back that seeing the fish was the best part of their day. After countless lab tours and slightly annoyed lab personnel, Farber asked the Dean if they could get money to hire a full-time person to do outreach. Shuda came on board soon after. The partnership of a scientist and an educator made BioEYES a success. Shuda was able to take Farber’s many great ideas, and then hone in on those that were actually doable for a classroom of 30 students. She studied the educational standards for different age groups and designed the BioEYES program around them. In an interview prior to the SDB meeting she said her focus was “how can we take something that’s already suppose to be taught, but do it in a way that’s very student centered, that actually gets them to explore science, and allows the teachers to actually have fun teaching these concepts.” The program gets students to think like a scientist while at the same time reinforces basic reading, writing, and math skills. “We teach in some of the most elite private schools in Philadelphia and some of the poorest neighborhoods in West Philadelphia and everybody gets a learning experience that they carry with them,” Shuda said. “I think that that’s what teachers appreciate ... that you don’t have to read on grade level to do BioEYES. English doesn’t have to be your first language.” BioEYES is for everyone. In fact, student assessments across age groups show the students do learn the concepts put forth in their BioEYES modules. 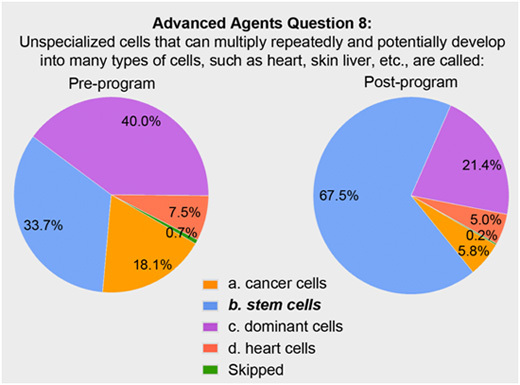 The pie graph below, for example, shows results of an advanced assessment question geared toward high school students. After a week of BioEYES, more students know what a stem cell is. “For me as an educator, I think it's fantastic that there’s a science society ... that is so interested and passionate about education,” Shuda said. This of course requires adequate funding. Farber and Shuda are always writing grants. “We are constantly strategizing and we have panic moments,” Farber said. BioEYES is funded by many local foundations who want to support science education. They also get funding from faculty who want to add an outreach component and enhance the “broader impacts” of their grants from the National Science Foundation or the National Institutes of Health. BioEYES is written into their grant proposals and when those grants get funded, BioEYES gets money to continue their programs. In addition, the grant recipients and their lab members can take part in an already existing program. These master teachers often report back on changes they have made or activities they created that they think could benefit all of BioEYES. “That has helped us expand ... and grow in a way we hadn’t anticipated,” Shuda said. 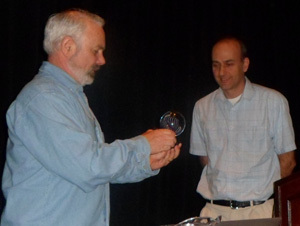 Scott Gilbert presents Farber with the Hamburger Prize at the 71st SDB Annual Meeting in Montreal, Canada. Shuda was unable to attend and received her award following the meeting. Farber actually expected teachers to pick it up faster. “I thought it would be easy and that every teacher would become a master teacher because I guess I didn’t really understand the literacy levels or the variation in science literacy among teachers,” he said. This is why Shuda and Farber are looking to expand the teacher professional development aspect of BioEYES. “When you really change substantively a teacher, you change all the kids that teacher’s going to teach [throughout] their career,” Farber said. To help facilitate this, BioEYES is working on a partnership with the Johns Hopkins School of Education, where Farber and Shuda have both been given secondary appointments. The School of Education has “acknowledged the impact of our program and [sees] it as a model for replication, and that will bring our voice to the table so we can talk about what we think the future of both professional development and pre-service should be for teachers,” Shuda said.